Drama at Leytonstone. Today you have it all. Jealousy, fear and obsession. Alfred Hitchcock was born in this town (near the end of the central line. (That's the red one on the tube map for the out of towners). To mark one hundred years since the birth of their local hero, with the slightly odd upbringing, (No wonder he became fascinated with psychological thrillers) stunning mosaics depicting scenes from his movies and portraits of his life were installed in Leystone tube station. The scene shown here is from Rebecca. Hitchcock's first American movie. Made in 1940, starring Laurence Olivier and Joan Fontaine. The new Mrs De Winter is being encouraged by Mrs Danvers (the jealous housekeeper) to commit suicide. Mrs Danvers had an obsession with Rebecca (the first Mrs De Winter) and wont accept the new wife. Tomorrow is competition day! Be here for a great prize. Interesting movie and very good mosaic. And the lady in the yellow dress looks like she is being a bit dramatic!! Nice to see he is still remembered. Certainly was a one of a kind. I really like Hitchcok's movies,great angle with the yellow woman dress in the background ! Wow - outstanding mosaic! Super subway shot! its great that the underground is being used to showcase its local history. Great picture and thanks for sharing! I had no idea about those. So thanks for sharing! God it was only ever bad grafitti when I travelled the tube! I like the artwork and love Hitch - a clever wee man altogether. By chance, I am re-reading 'Rebecca' at the moment. It's slow going though. Because I know what is going to happen the tension is all the more and I hate picking up the book. There is nothing I can do to stop the story. It's not even as if it has a truly happy ending. I think I'll manage better once I get past the 'dress' bit! Beautiful mosaic. Wish our tributes in the states were as clever and long lasting. That is a really good idea. Great tribute to the man. 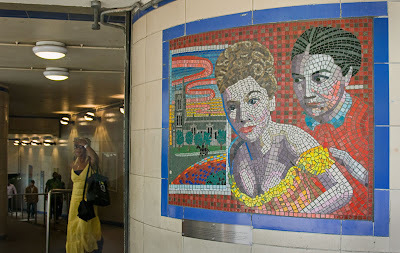 I lived in Leytonstone for some time and there are a whole set of these mosaics through the tunnel, was an interesting start to the day going past the mosaic for "Psycho" every morning (yes, it's the shot of the woman in the shower). As far as I'm aware, the mosaics are a permanent feature of the station.